Our life processes require energy. Some of this energy comes from the foods we eat (caloric energy), and some comes from the subtle, cosmic energy that is all around us. This cosmic energy supports the body’s innate intelligence and self healing capabilities. I’ve been working with this subtle energy, helping people bring their lives into balance, for over 20 years. My passions for learning, teaching, and finding and creating solutions to problems, help me to assist people harness cosmic energy for well being. With creative solutions that are thoughtful and delivered with compassion… people feel better. Working with you, together, we can address anything you can imagine. Get a new perspective by looking at photographs of the energy rainbows that appear and radiate around people, places, and things. Increase your knowledge of the dynamic electromagnetic field that each of us create. 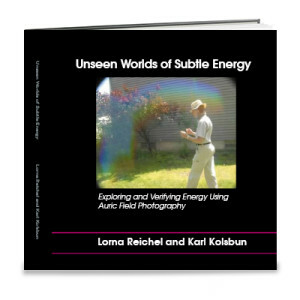 “Unseen Worlds of Subtle Energy: Exploring and Verifying Energy Using Auric Field Photography” Photographed and written by Lorna Reichel with intuitive perceptions by Karl K. Kolsbun. I’d love to present to your group! Receive useful, practical information. Get new perspectives of reality that empower & inspire. For a fun, light hearted intro to subtle energy, I offer “Exploring & Playing with Energy Workshop.” To explore wellness and the power of intention, I offer, “Human Transformation and the Art of Creating Health.” See awesome visuals, learn the meaning of colors in the aura, and experience the power of directed intention (subtle energy). Mt. Ida Natural Quartz Crystals. These clear, finger sized crystals are great for balancing and clearing subtle energy, planetary healing, and healing grids. Receive information, balance energy for the highest good, and/or get a second opinion on your dowsing results. If you would like to learn to dowse, I’ll teach you practical skills that can make a difference in your life. Individual and group classes. Educate yourself by browsing my website. Then call me for a consultation, to make a purchase, or questions. Overcome obstacles and accomplish your goals! Call (518) 383-9066. Join My Mailing List. Stay informed. 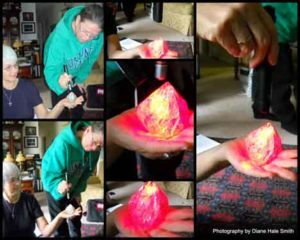 All In The Mind learning group working with a cold light laser and natural quartz crystal. Copyright ©2017-2018 Lorna Reichel, All rights reserved. Photographs on this website are protected by US copyright law and may not be used for any purpose, without permission from Lorna Reichel.